Several years ago, my husband and I had occasion to visit Pershing County, Nevada and, while there, decided to explore. We enjoyed the region and began to return regularly. Rosebud Canyon in the Kamma Mountains became a favorite destination and from there we gradually increased our explorations of the Kamma range, as well as the adjoining Lava Beds and Seven Troughs. The Kamma Mountains lie west of Winnemucca and north of Lovelock in a desert wilderness region of Pershing County. When we began our sojourns in the Nevada desert, news drifted to me of wild horse round-ups and opposition from protesters. I attempted to sort out the controversy: events, timelines, laws. Eventually I gained a sense of which sources I could trust and high on that list was Laura Leigh, founder of Wild Horse Education. But while Leigh’s writings and photographs were revelatory, I still felt an uneasy disconnect. I needed a touchstone, a starting point, where I could begin to form a story of my own. Then came an opportunity to crystallize my research. 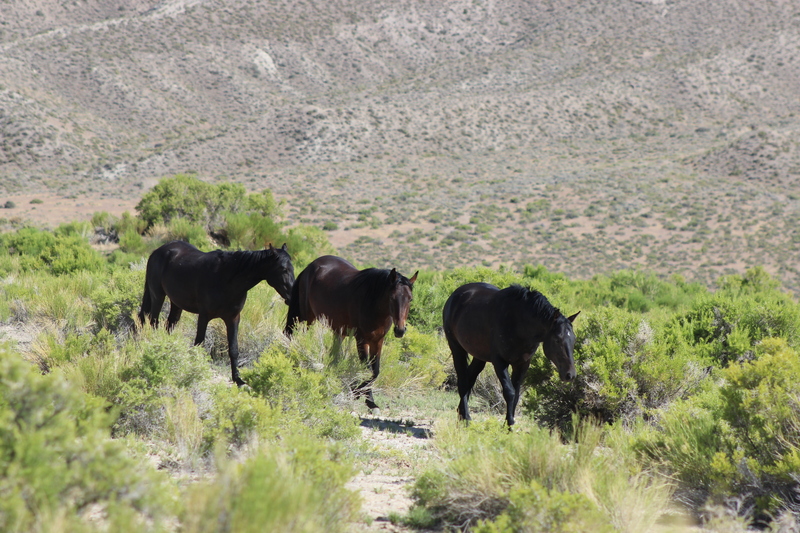 In August of 2012 as we drove through the Kamma Mountains at the southeast edge of the Black Rock Desert, a wild horse crossed the road in front of us to challenge a stallion with two mares. For me it was love at first sight. I cried for a long time as I watched. I cried because the research clanging in my head–the mustangs are feral, the mustangs are native, the mustangs don’t have a right to be on public lands, the mustangs are protected by legislation, they are protected but they eat too much, they are sick, they are starving, the mustangs will be better off in captivity–finally quieted, and before me, gleaming, muscled, proud and purposed was one of those horses and I knew then that I wanted only one thing from that horse: more. From that point on the Kamma Mountains wild horses became a major focus of our Nevada desert journeys. That same day in August of 2012 we met a family band headed by a precocious black stallion with several slender mares and two yearlings. We have since seen this band numerous times. The stallion is settled, the mares have filled out and the yearlings have grown into playful colts. It appears this is the largest established band in the Kamma Mountains. The size and make-up fluctuates but there is a constant core group. In the spring of 2014, we witnessed the addition of three foals to the family, which seems to favor the western third of the Kamma range. On the east end of the Kamma range lives a horse we call, “Second Chance.” His right hind quarter is severely scarred from what must have been, at one time, a life-threatening injury. He resides apart from other horses–probably ostracized–yet, on two occasions, has sought us in a way which suggests he is hungry to socialize and resilient enough to make the first overture. As cherished as it is, the experience of coming to know the Kamma Mountains mustangs has been bittersweet. Juxtaposed with our visits to the Kamma Mountains has been the removal by the U.S. government of thousands of wild horses from our western states, including Nevada and its Kamma Mountains. The Bureau of Land Management, field agency for the Department of the Interior, “gathers” the horses and, if they survive, places them in holding facilities. The gathers are held in response to protests from ranchers that the wild horses are consuming too much of the range’s forage. Ranchers pay the BLM a nominal fee to supplement grazing with forage on U.S. public lands.